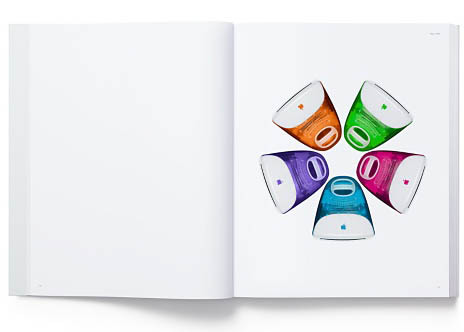 Apple's new "Designed by Apple in California" photo book, chronicling 20 years of Apple design with 450 photos of its products and the processes used to make them, is now available for purchase on Apple's website in a smaller 10.2×12.8 inches size for $199 and a larger 13×16.3 inches size for $299. The 300-page hardback book, reflecting the time period between the original iMac and Apple Pencil, is estimated to ship in 1 business day in the United States. It is also available in the United Kingdom for £169/£249, with estimated delivery by Friday, and in Australia, France, Germany, Hong Kong, Japan, South Korea, and Taiwan. The book is dedicated in the memory of late Apple co-founder Steve Jobs. The photos were taken by photographer Andrew Zuckerman. A visual history spanning iMac to Apple Pencil, complete with descriptions of innovative materials and techniques, it captures every detail with honesty and intention. Printed on specially milled German paper with gilded matte silver edges, using eight color separations and low-ghost inks, this hardcover volume took more than eight years to create and has been crafted with as much care and attention as the products featured within. It is both a testament and a tribute to the meticulous design, engineering, and manufacturing methods that are singularly Apple. The book is also now available at select Apple retail stores, such as Apple Regent Street in London, Apple Opera in Paris, and Apple Ginza in Tokyo. In the U.S., this includes various locations in New York City, Los Angeles, Chicago, Miami, Dallas, San Francisco, and Palo Alto, and at Apple's campus store at its Cupertino headquarters. Finally, a mac book for $299 !!! The book is too fat. I'll wait for next year's thinner version. Book is $299. Silicone slipcover is availalbe for $79. Premium leather for $149. Also availalbe USB* page warmer for $199 (*requires extra cost USB-C dongle for use with 2016 MacBook Pro). I already own a book. I might consider this when my current book wears out. I wonder if there will be an iBooks version. Wow! $300 for a book!? Flip through one at an Apple Store. Once you've seen the pictures, you've seen them. Next. They will for sure be sealed at the Apple Store. You aren't going to be flipping through anything. Overpriced, underfeatured, but it sure looks pretty. In other words, right in line with the new product strategy this year.